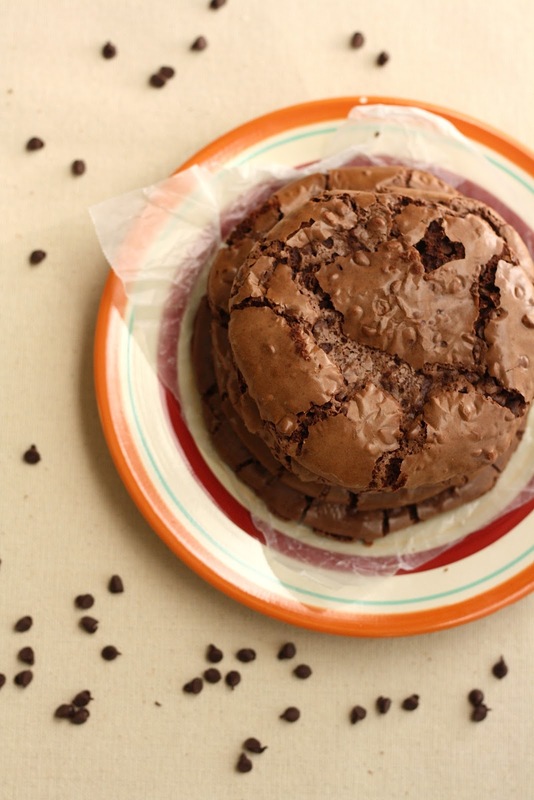 There is a bakery near my office -- Nuvrei -- that sells the best double chocolate cookies in the world. I mean, the BEST. These super dark (almost black!) cookies that are almost overshadowed by the bakery's more colorful macarons and dark golden pretzel bagels. Almost. Because those who know... know. 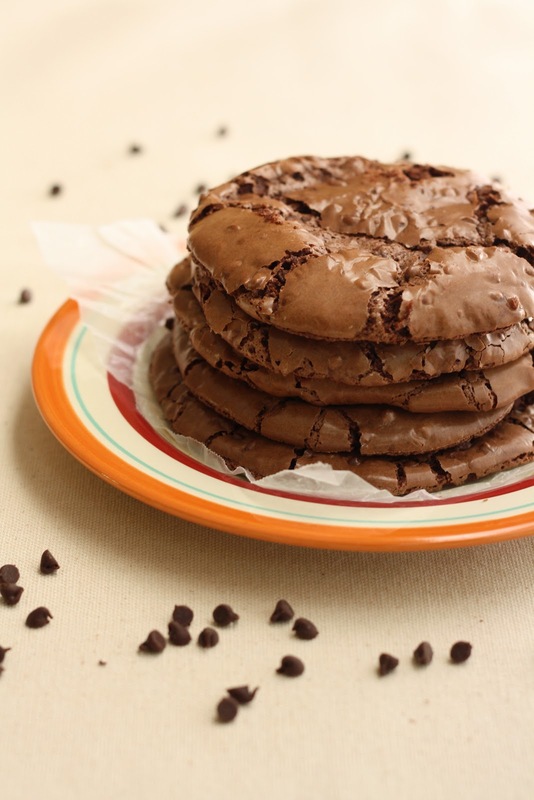 These cookies are almost contradictory -- they almost melt in your mouth, but happen to be both chewy and crispy and chocolatey with every bite. These are the cookies to END all other cookies. The one that rules them all. And I think I've figured out the recipe! Now my coworker has pointed out that Nuvrei actually sells the cookie mix... but where's the fun in that? This way, I get the adventure of figuring out the recipe without having to pay the bakery $18 for a paltry box mix. And I'm happy to say, I think I got it. And finally, throw in some flakey chunks of salt to get that satisfying, salted-chocolate kick. While these cookies aren't exactly identical to Nuvrei's -- because let's face it, that bakery is phenomenal and there's no way I will ever be able to figure out their recipes on my own -- I'm pretty satisfied with the outcome. These cookies almost taste like crispy edged brownies... but in cookie form! Two of my favorite desserts coming together? Ain't got no problem with that. Preheat oven to 350 (F). In a medium bowl, whisk together 3 cups confectioner's sugar, 2/3 cup cocoa powder, 1/4 teaspoon salt, 1 1/4 cups mini chocolate chips. Set aside. In a small bowl, stir together 4 egg whites with 2 teaspoons vanilla. Pour into the medium bowl filled with dry ingredients (from the first step), and use a rubber spatula to stir the ingredients together until well-combined. Don't worry if your batter looks too liquidy! This is normally -- it should have a sludgey, paste-like consistency. If your batter is still too liquidy (if it has the consistency of milk, it's too liquidy), keep adding 1 tablespoon quantities of confectioner's sugar until you have the right consistency. Line a baking sheet with parchment or a Silpat and use a cookie scoop to spoon 2 tablespoons of batter on top of each other (if you want to make smaller cookies, just spoon 1 tablespoons worth of batter). Leave plenty of space between the cookies because they will SPREAD. Bake at 350 (F) for 14 minutes, or until the tops of the cookies are cracked, glossy, and flakey. Rest the baking sheet on a cooling rack and leave the cookies on the baking sheet for 10-15 minutes. Once the cookies have "set", use a metal spatula to turn them into the cooling rack to cool completely. 1. 1/2 chocolate chips, 1/2 mint chips. If I can't find mint chips, I use 1/2 tsp. peppermint extract. 2. I've used two different ovens, and both times 14 minutes results in baked-to-a-crisp cookies. I've found 9 minutes to be the magic number. Wait til the edges are crispy/flaky but the middle is still a bit soft (not the super-dark brown of the batter; slightly less dark). These are incredible! I was at a potluck recently and someone brought a pie made from your banana cream pie recipe. I asked her where she got it and she sent me your blog link. Wow. There is SO much here. I want to share your link with as many people as possible so I have nominated you for the One Lovely Blog award. In case you don't know about these awars, it is a way for bloggers to receive and give appreciation from/to their peers. It also allows blog readers to learn about blogs they might find of interest. Aww, thanks for the kind words and the nomination! That is very sweet of you.